I am 15 years old and I have a 16th birthday coming up in August. I want to do a belly dancing show for my family. It may sound weird but it's different, you know.The usual 16th birthday for females is a big birthday party with balloons, DJ's, and huge unnecessary little girl things. For my 16th, I want to be an image of a beautiful and seductive goddess. I always have been interested in Gypsies and goddesses. So this is my year to have a special but different but memorable birthday! I wanted to know if you could give me some make-up tips (lipsticks, eyeshadows, and eyeliners; body jewels; seductive hairstyles). And what color do you think is wonderful for this occasion? I would really appreciate your opinion! You are wise to seek artistic advice on this matter. You, as a belly dancer, need a breathtaking look for your birthday. For this occasion, I'd avoid black (too old), white (too angelic) and too many gaudy colors together (not goddesslike). Choose one theme color that looks gorgeous on you, then you can add silver, gold, or bronze. To look Goddesslike, adorn your face and hair. Try jewels glued to your forehead or cheeks (or navel!) with spirit gum (available in costume supply shops) or tribal tattoos drawn on with colored make-up pencil. Glittery skin, hair and lip cosmetics are inexpensive in any drugstore. Practice making up your eyes to the max with dark liner. Be bold, be exotic, but again, avoid the gaudiest, clownlike colors. Your hair: try a single braid or many with gold ropes or strings of pearls twisted in; a jeweled headband with pendants hanging on your forehead; a metallic scarf twisted into a thick rope around your head; or a spray of feathers. Look in craft shops for these items at low cost. For something really outstanding, wear a Cleopatra wig (available in my area for $20 or so), or a coin or beaded headdress such as they sell in Egyptian import shops or costume supply shops. Prices vary. 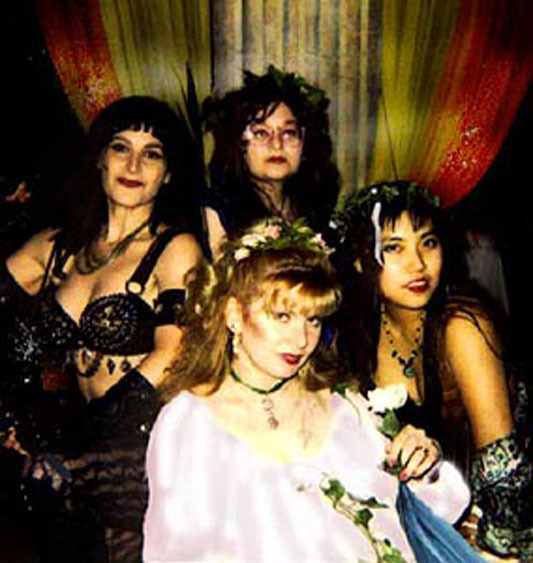 This photo (to the right) shows me in my warrior princess costume, along with my friends Sa'ida, Goddess of Spring; Liz, and Emenke at Seattle's Mythological Ball. Click on it to see the photo in more detail. Search secondhand and vintage stores, and flea markets to find Goddesslike veils, necklaces, bracelets, armbands, earrings, toe rings, and nose rings (if that's your preference). A beautiful necklace can also be worn as a headband or braid adornment. A long earring can be a tassel. Pendants, beads, and coins can be sewn to the hem of a midriff shirt or skirt. A face veil can create a look of mysterious allure! Happy, wonderful 16th birthday, have fun with it! 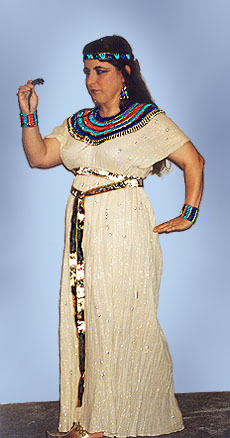 If the type of goddess you'd like to portray is an Egyptian one, you may want to consider Arabella's instructions on how to make an Egyptian broad collar, headband, wristbands, and dress, as shown in this photo. If you decide to go with the look of an Egyptian goddess, use heavy eyeliner. Extend it in a line from the outer corner of the eye toward the hairline, as shown in this section of the drawing of the Three Musicians from the Tomb of Nakht in the Valley of the Nobles near Luxor, Egypt. Making Pharaonic Collar, Headband, Wristbands, & Dress. Instructions by Arabella for achieving an Egyptian Pharaonic look. The Goddesses of Ancient Egypt. Introduction to the goddesses of the ancient Egyptian religion.